Tech investor Peter Thiel talked cryptocurrencies, the potential outcome of the 2020 election, and Silicon Valley’s insulated culture during a fireside chat at the Economic Club of New York on Thursday. Thiel, an early bitcoin investor, predicted there will be one leading future cryptocurrency that will be the digital equivalent of gold. Thiel suggested that, if President Donald Trump runs again, he’d see a positive outcome in the 2020 election. Thiel also chatted candidly about his negative opinions of Silicon Valley, which he described as having a “lemming-like” quality. Tech investor and Facebook board member Peter Thiel chatted on Thursday with Fox Business Network anchor Maria Bartiromo during a fireside chat at the Economic Club of New York. Thiel talked about a variety of things, including the viability of cryptocurrencies, the results of the 2020 election if President Donald Trump were to run again, and Silicon Valley’s insulated culture. Thiel, who has invested more than $US15 million in bitcoin along with his investment firm, said he’s “long bitcoin, neutral to sceptical on everything else.” “I’m not exactly sure whether or not I would encourage people to turn out and buy these cryptocurrencies right now,” he said. In the future, Thiel predicted that there will be one prevailing cryptocurrency that will be viewed as the digital equivalent of gold. “It will most likely be bitcoin,” Thiel said, although he hinted at the possibility of ethereum. Thiel seemed unswayed by the increasing speculation regarding what many feel to be the cryptocurrency bubble. Thiel, who recently announced he intends to move from his longtime home of Silicon Valley to Los Angeles, reiterated his thoughts that the tech hub has become the home of pervasively hermetic ideologies. More than once Thiel described the valley’s tech community as having a “lemming-like” quality that lacked diversity of thought. “I thought it would be healthier to be somewhere outside [Silicon Valley],” Thiel said. Thiel stressed the importance of investors considering the geographic expansion of the tech community, not only within the US but globally as well. Drew Angerer/GettyMike Pence, Donald Trump, and Peter Thiel. 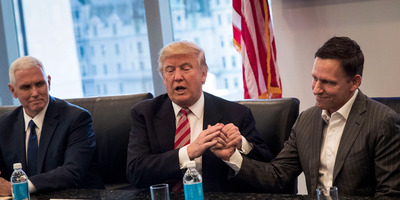 Thiel said his stance on global economics was a contributing factor in his political backing of Trump, a move that was controversial within the left-leaning community of Silicon Valley. “I thought that supporting Trump was one of the least contrarian things I’ve ever done,” Thiel said, citing the president’s popularity among voters and his victory. Thiel, while initially hesitant to speculate on the 2020 election, predicted a positive outcome for Trump.